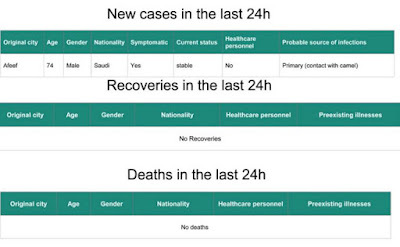 Although we haven't seen a huge spike in MERS cases this year - mostly due to a lack of large nosocomial outbreaks - we continue to see a steady drip . . drip . . .drip of new primary cases - many with camel contact (either direct or indirect). 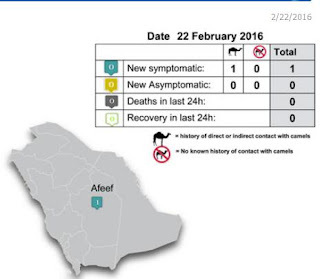 Today's case (74, M, Camel contact) is the 13th reported from KSA in the past month month. This morning I also blogged on a case in Qatar, with recent travel history to Saudi Arabia. Camel (or camel product) exposure has figured prominently in most of the recently reported community acquired cases. Last November, in EID Journal: Risk Factors For Primary MERS-CoV Infection, Saudi Arabia, we finally saw a small case-control study come out of KSA that found 33% of their subjects reported camel contact in the 14 days prior to falling ill vs. 15% in the control group. While statistically significant, this obviously leaves a good many primary cases for whom camel contact does not appear to be a factor. 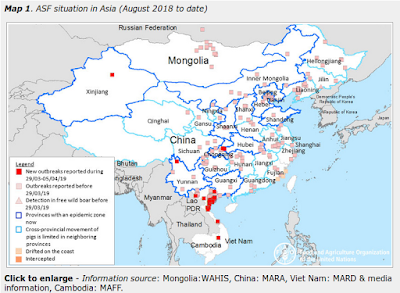 As mild and/or asymptomatic carriage of the MERS virus has been frequently observed, limited unrecognized community spread of this virus is also a distinct possibility (see The Community Transmission Mystery and WHO Guidance On The Management Of Asymptomatic MERS Cases). Still, figuring out better ways to interrupt camel-to-human transmission of MERS-CoV would go a long ways towards stopping the constant reintroduction of the virus into the human population.